Helen Schnabel, born in New York of Austrian parents, made her first public appearance at Carnegie Hall at the age of nine as a child prodigy. Under her maiden name, Helen Fogel, she broadcast frequently in the following years and gave recitals in New York when 11 and 12 years old. She studied with Manfred Malkin and with Alexander Siloti on a fellowship at the Juilliard Graduate School, graduating at age 21. With reputation already established, Helen Schnabel spent four years, from 1934 to 1938, studying with Artur Schnabel at Lake Como in Italy. It was here that she met Artur Schnabel’s son, Karl Ulrich. Helen and Karl Ulrich Schnabel were married in 1939. In 1941 their only child, Ann, was born. They started a duo career a few years later with a series of six broadcasts in New York, followed by recitals in USA and Canada. After the war, they extended their duo concert activity to Europe where in 1956 they participated in the Holland Festival with five orchestral concerts and in 1972 at the Edinburgh Festival. 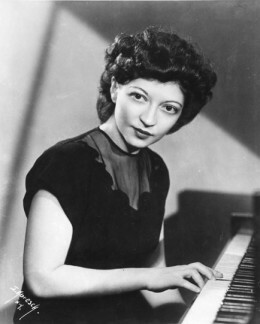 Helen Schnabel continued to concertize extensively as a solo pianist. She was also a beloved teacher at the Dalcroze School, beginning in 1940. After 1948 she spent summers teaching in yearly master classes at Lake Como Italy, as Artur Schnabel had done before World War II. Recordings include concertos by Mozart, Beethoven, C.P.E. Bach and Artur Schnabel, and solo works by Schubert, Mendelssohn, Brahms, Weber, Malipiero and Artur Schnabel under the labels Epic, SPA, Philips, and Sheffield/TownHall Records. Helen Schnabel died at Lake Como, Italy, in 1974. Link at Women at the Piano.